Guide to Tarragona, a city located on the Costa Dorada, Spain. Tarragona Spain - A historic city and port located in the southern Catalonia region of Spain, Tarragona has a population of 134,163 (2007) and a municipal area of 181.60 square kilometres, and is the capital of the Tarragona province of Catalonia. 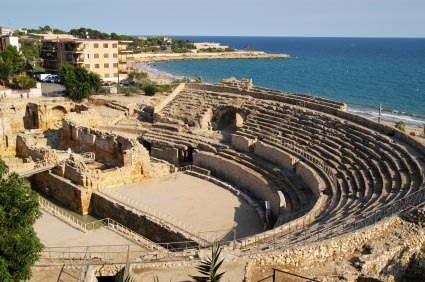 Tarragona was extremely important during Roman times and was established as their base for the conquest of the Iberian Peninsular which began in the 3rd century BC. The Roman city was called Tarraco and under Augustus became the capital of the Tarraconesis province of Hispania, it was the most elegant city in Roman Spain. It was quite possibly settled even earlier than this and the Romans would have probably found an existing Iberian culture when they arrived, it may even have been founded by the Phoenicians who set up numerous trading posts along the Spanish coast. The Romans built a significant fortified city here with numerous temples and monuments, the population at this time was as high as 250,000. Though Tarragona has been sacked and looted many times through the centuries, much of the original Roman construction still remains. The best known monument from the Roman times is the well preserved amphitheatre (see picture above), located at the end of the ‘Rambla Vella’, it dates from the 2nd century BC and had room for 13,000 spectators. Over the foundations of the amphitheatre a later Visigothic basilica was built and later still the Santa Maria del Miracle church, the ruins of which can still be seen. Nearby is the Praetorium, a Roman tower that was later converted into a medieval palace, known by the name Castell de Pilato (after Pontius Plate) it now houses an interesting museum (Museu de la Romanitat) with many Roman and medieval artefacts, an even better collection of Roman artefacts can be found in the Museu Nacional Arqueològic. Remains of immense Cyclopean walls are thought to date from before the Romans arrived in Tarragona, and much of the stone from these was used for other building projects. Travel four kilometres north of the city and you will find the magnificent Roman aqueduct which is 700 feet long, with arches up to 96 feet high, it is known locally as El Pont del Diable (Devils Bridge) and was built to bring water to the city from the River Gayo some 32 kilometres away. Another monument east of the city is known as the “Tower of the Scipios” (Torre dels Escipions), it is a funerary monument dating from the 1st century AD. In the city itself you will find plenty of places to visit, most head for the cathedral which dates from the 12th century and has Romanesque and Gothic sections, the highlight is the alabaster alterpiece of St Tecla, carved by Pere Joan in the 15th century. A couple of museums worth exploring include the Museu Diocesa and the Casa Museu de Castellarnau. Present day Tarragona is a busy industrial city, home to a large and busy port and also a University (Universitat Rovira I Virgili), it’s main industry is chemical manufacture and there are numerous chemical plants in and around the city. Tarragona Beaches - Tarragona is a coastal city and as such boasts a number of fine beaches in it’s environs, some with ‘Blue Flag’ status for cleanliness. To the south of the city you will find the seaside resorts of La Pineda and Salou, both renowned as holiday destinations. In Salou you will find the Port Aventura theme park. Tarragona Hotels: Tarragona has a wide choice of hotels, some in the city itself include the Hotel Ciutat de Tarragona (+34 977 250 999), the Hotel Plaça la Font (+34 977 246 134), the Hotel AC Tarragona (+34 977 247 105) and the Hotel Nuria (+34 977 235 007). Tarragona Markets: Regular markets are held on the Rambla Nova, the main market is on a Thursday. Tarragona Fiestas: Tarragona holds numerous fiestas and festivals including the Carnival (February), the Fiestas de Santa Tecla (september) and the Fiesta of St Magi in August. Tarragona Camping: There are plenty of camping facilities near to Tarragona city and these include the Camping Las Palmeras site - Ctra. N. 340, P.Km. 1168 just 5 kilometres from the city centre (tel: 977 208 081). Tarragona can be reached via the A-7 (E-15) motorway or from the N-340 and is located between Barcelona and Tortosa, it is about 90 kilometres from Barcelona airport.